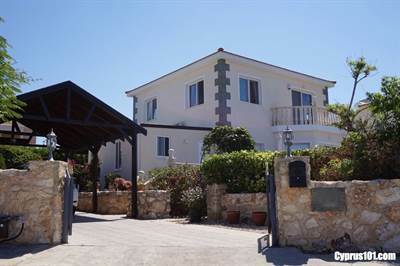 • 160 sqm , 4 bath , 4 bdrm 2 storey – FOR SALE €349,000 EUR . Fully Furnished w/ many extras & Title Deeds. This impressive 4 bedroom detached villa is situated in a sought after residential neighbourhood in the prestigious area of Sea Caves, famous for it’s natural environmental beauty and luxury homes. The coast and many amenities of Peyia and Coral Bay are a few minute’s drive away. The property is light and spacious throughout with quality modern finishes and benefits from stunning panoramic sea views. The ground floor accommodation features a comfortable lounge with wood burner fire, study space, formal dining area, large kitchen with breakfast bar, utility room/guest cloakroom and double size bedroom with en-suite shower room. A marble staircase leads up to the master bedroom with en-suite shower room and private balcony, two further double bedrooms and a family size bathroom with corner bath, vanity unit and heated towel rail. All bedrooms include fitted wardrobes. The outdoor leisure space is equally well designed with many different areas in which to relax and enjoy the amazing outdoor life. The swimming pool and surrounding terrace is situated in a beautifully landscaped private garden with upper seating terrace. To the rear of the property is a peaceful corner garden with decked seating area and pergola above. This property is perfect as either a permanent residence or holiday home/retreat. It comes fully furnished with many extras and has full title deeds.